Family ByCycle: What did you bring home from your holiday? A fridge magnet? A snowglobe? An 'I [heart] <insert place name here>' t-shirt? Diarrhoea? Tonight, I had one of those moments when you just go for broke on the culinary front. 'Caution to the wind' job. "Let's do Thomas Ivor some galettes before he goes back to school". 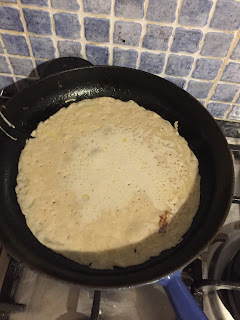 As perhaps befits such an effort, I managed to end up producing six litres of batter, which turns out to be twice what we were up for consuming, and my technique is still, shall we say, 'improving', but it worked! The egg one went a bit wrong, but cheese and ham worked nicely, and magically, the creme fraiche and smoked salmon came good, too. Took me right back to lunch in St Méen le Grand, just missing the scallops! 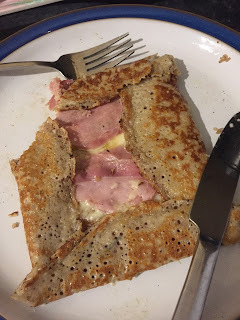 We haven't had galettes since we left Brittany a few weeks ago, having enjoyed the traditional Breton staple with all manner of fillings most days during our trip there. 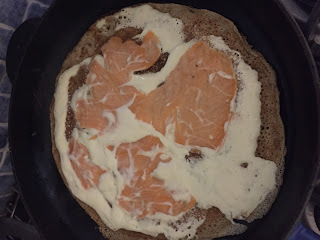 Yes, we have our memories, and our photographs, our blog posts and videos, but how wonderful to bring home the means to have a little taste of our French adventure any time we like.